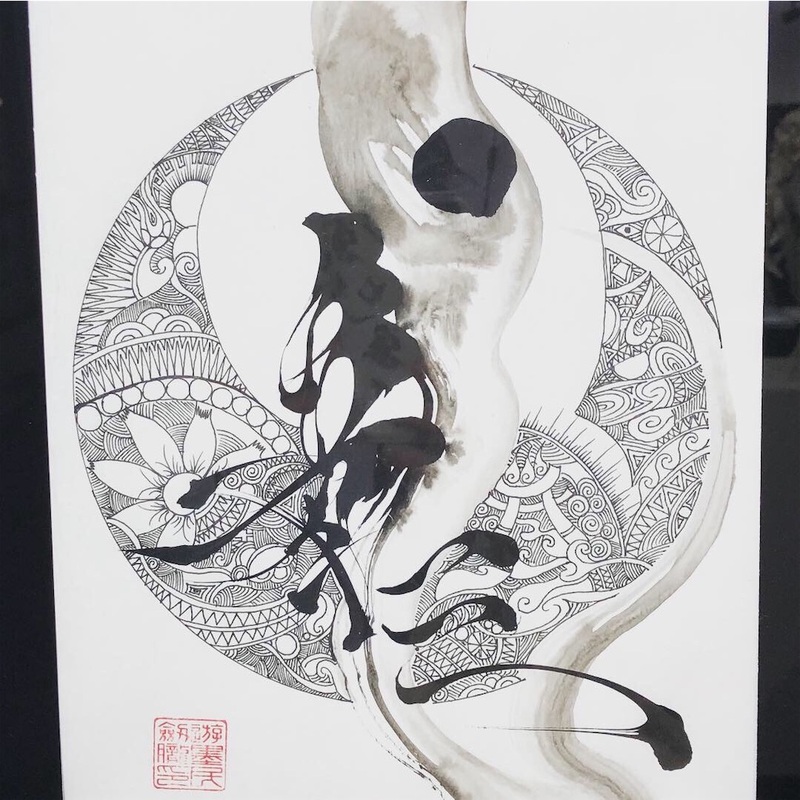 The gallery near my office holds weekly rotating exhibits, and earlier this year there was one interesting exhibit titled "Seimei no Shin-en (The Depths of Life)". 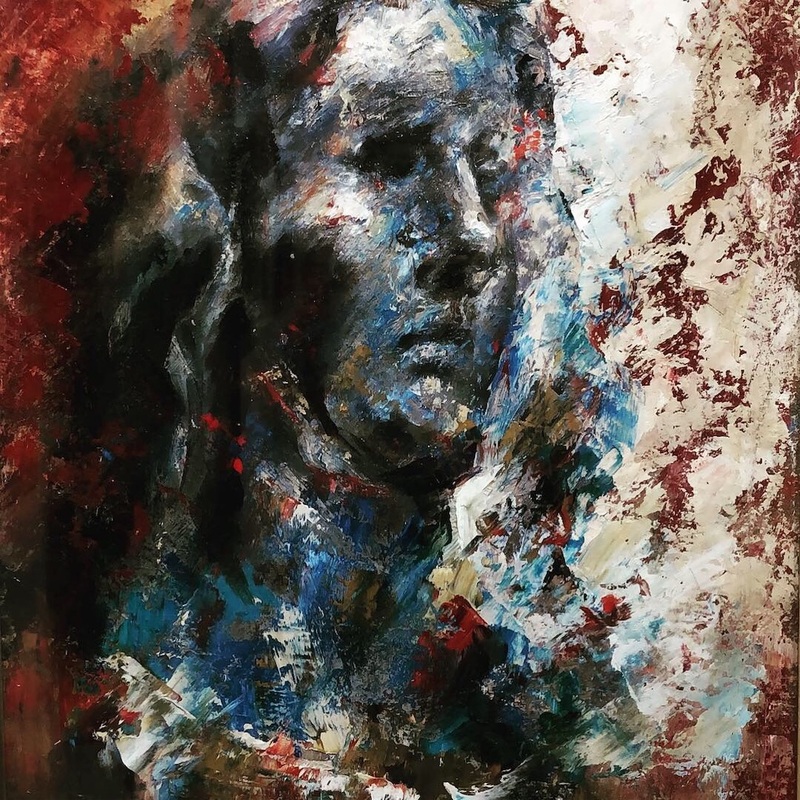 The works on display reflected this theme, laying bare the sadness and negative aspects lurking within the shadows cast by all forms of life, including we human beings. Looking at all the pieces in the exhibit, I came away feeling that we need to accept the fact this darkness is inextricable from the light. There were two particular pieces that caught my eye. The first was titled "Hibaku Suru Sei Maria (Mother Maria Bathed in Radiation)". The instant I saw the title, my mind raced to the Urakami Cathedral in Nagasaki that was destroyed in the atomic bombing. The red hues gave off a fire-like heat, evoking images of suffering in the flames from the nuclear blast. 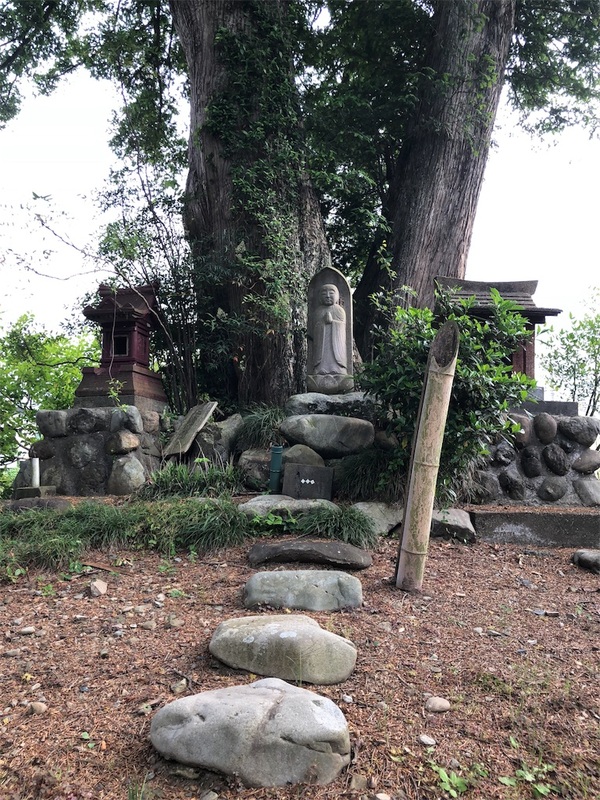 At the same time, I found myself taking away another interpretation, one in which the red signified both the love of Mary and the fervent faith of the "kakure kurishitan (Christians in hiding)" in Nagasaki and other parts of Japan. The other piece that struck me was titled "Hi-ai (Sorrow)". The two kanji that make up the word both can be read as "kanashimi (sadness)" in Japanese, and together they created an image of sinking into the depths of a pool of sorrow that I thought matched the piece perfectly. However, in the depths of this sorrow a single white #cross acts as a bright shining light, seemingly hinting at the purpose religion serves in our lives, whether that be to ease the sadness in our hearts or provide salvation for our souls. When I look back on these two pieces, a tweet by Vinland Saga creator Makoto Yukimura comes to mind. "It's impossible to draw white clothing when someone demands that you only use white paint. Quite the opposite. You need a lot of different paints to depict white clothing. Sometimes that means using black as well. This is what I want people to understand: You need black and shades of burnt brown to depict white." Yukimura’s words are another great reminder of the fact that the light and darkness are inseparable. Indeed, within the darkness lies knowledge to be gleaned of the true nature of the light. 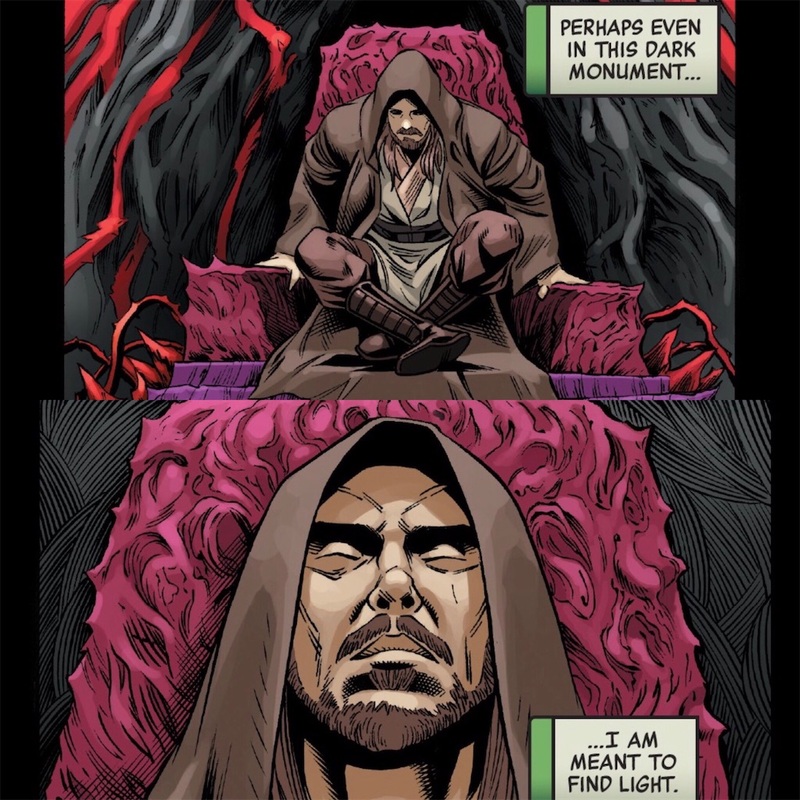 The old Jedi Order in Star Wars feared this darkness, and for thousands of years they maintained that outright rejection of it was fundamental part of what it meant to be a Jedi. 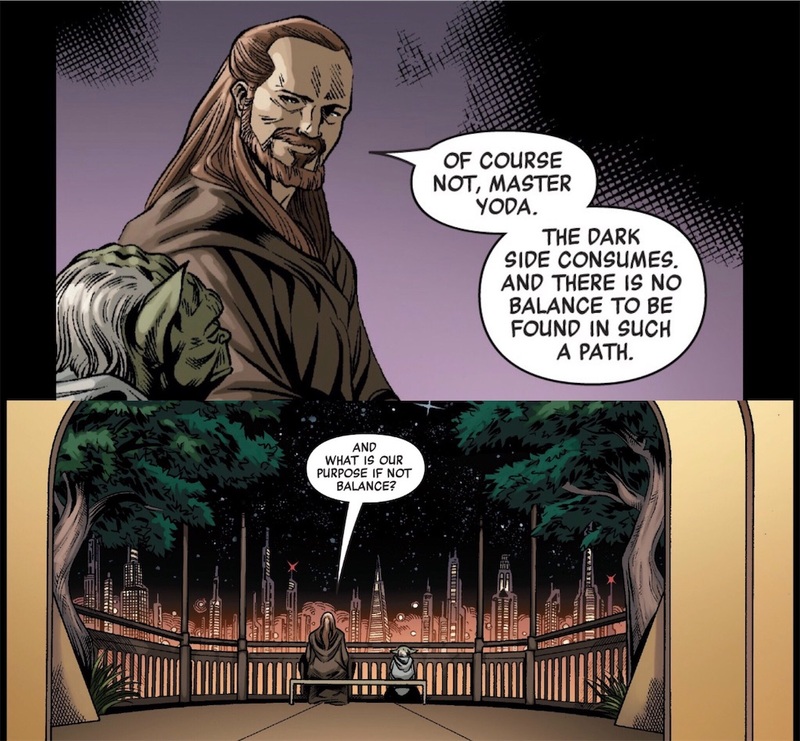 However, there was one Jedi in the final days of the Old Republic who questioned this truth: Qui Gon Jin, the master of Obi Wan Kenobi. He felt that it was necessary to explore all facets of the Force to deepen one’s understanding of it, believing that the true purpose of all Force users was to uncover the lessons that lie therein. As such, he viewed the Dark Side of the Force not as a presence to be rejected, but rather essential to understanding the Light Side. 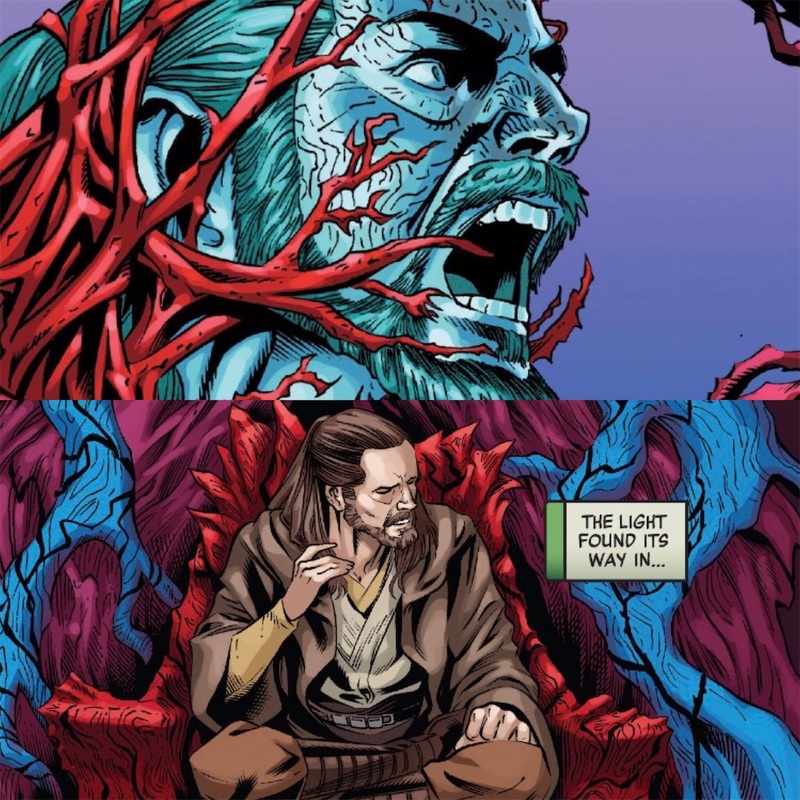 His exploration of the Force is beautifully portrayed in the Age of the Republic series that was released towards the end of 2018. The following is my own Japanese translation of some of those scenes (spoiler warning). The path of darkness is synonymous with the road to personal ruin. That said, turning to face this darkness makes the light shine all the brighter and helps us understand its nature. Just as one day consists of both daytime and night, the Force as it is portrayed in Star Wars is formed of the coexistence of light and dark. 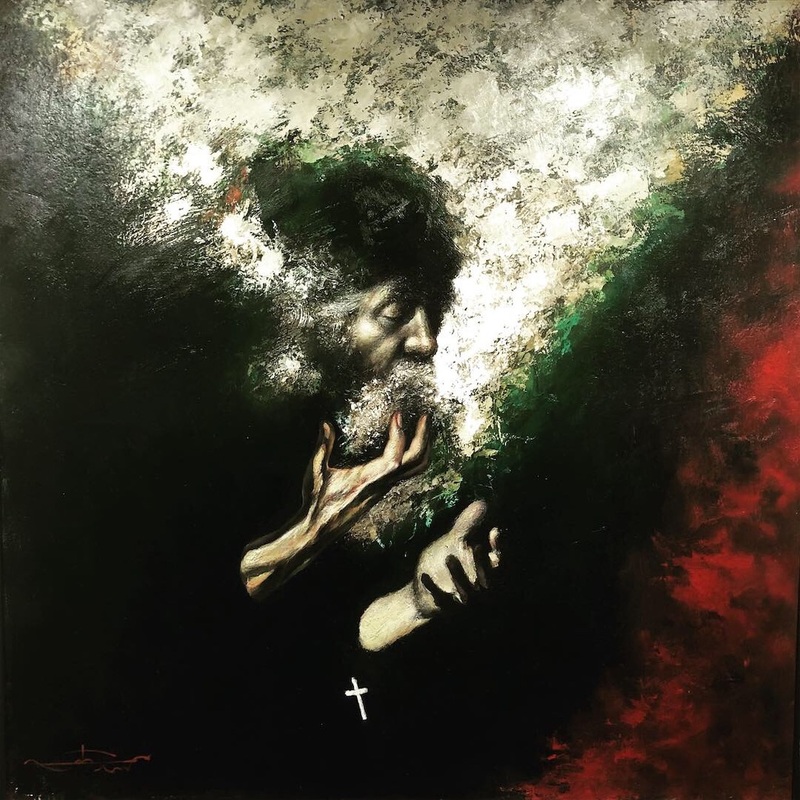 This “realization” is the destination I arrived at on the journey sparked by two pieces of art I highlighted at the beginning of this post. “The New World” is one of the names used to describe the Americas in the annals of history. This name implies that the history of that "new world" began when it was discovered by explorers from “the Old World” who crossed the Atlantic Ocean. This interpretation pervades the textbooks that someone like me, born and raised in the US, used in elementary and middle school when they were a child. However, these continents were far from an “uninhabited new world”, but in fact a rather old world with its own human history that stretched back tens of thousands of years. When European explorers landed in the Americas, they found peoples who had built rich and sophisticated civilizations of their own. These peoples are the Native Americans, but today their story is not given its due deserve in the “official history” of the US. In fact, they are largely removed from that tale. This song was written in 1966 by Buffy Sainte-Marie, an indigenous (Cree tribe) activist born in Canada. 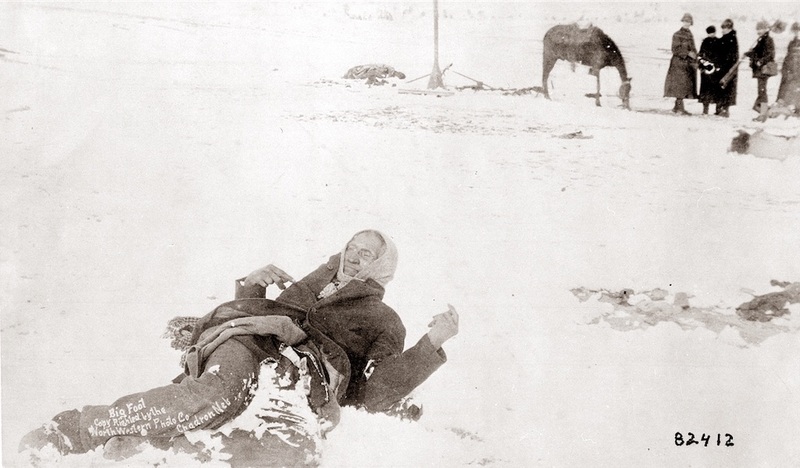 It portrays the other side of American history as seen through the eyes of Native Americans. The Japanese translation is my own, and as such some of the expressions are not 100% natural. I just hope it provides a nice reference for the meaning of the lyrics. 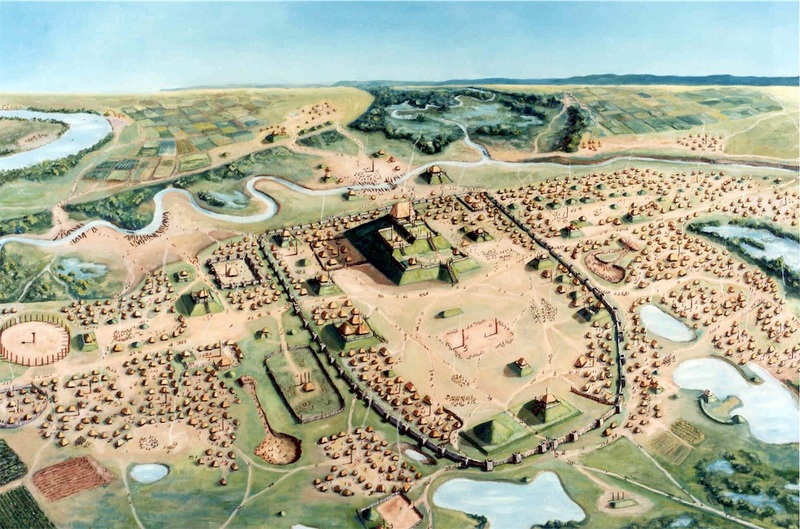 An artist's rendering of Cahokia at its height. Cahokia, located in present-day southern Illinois, was a religious and political center of the Mississippian Culture. It boasted a population of 10,000 at its height, with a trade network stretching all the way to Mexico. The base of Monks' Mound, the symbol of Cahokia, is wider than those of the great pyramids of Egypt and the Pyramid of the Sun in central Mexico. The works of art we see in book collections are no more than "reproductions". We are painfully reminded of that we see the real thing. 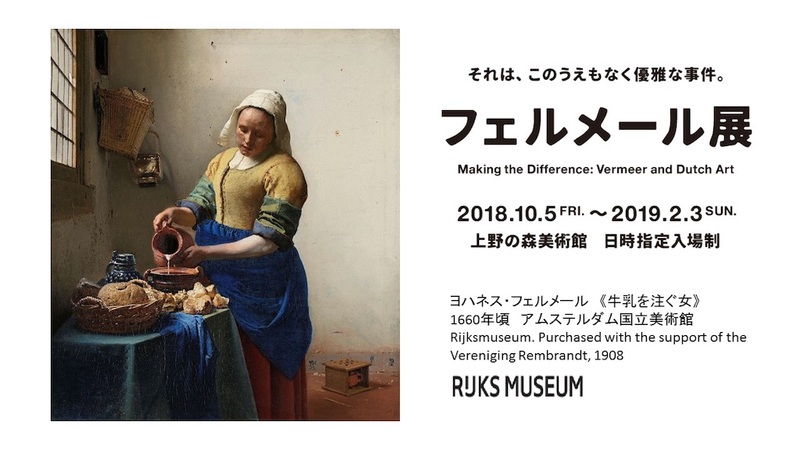 This is exactly what I thought when I went to see "Making the Difference: Vermeer and Dutch Art with a friend. 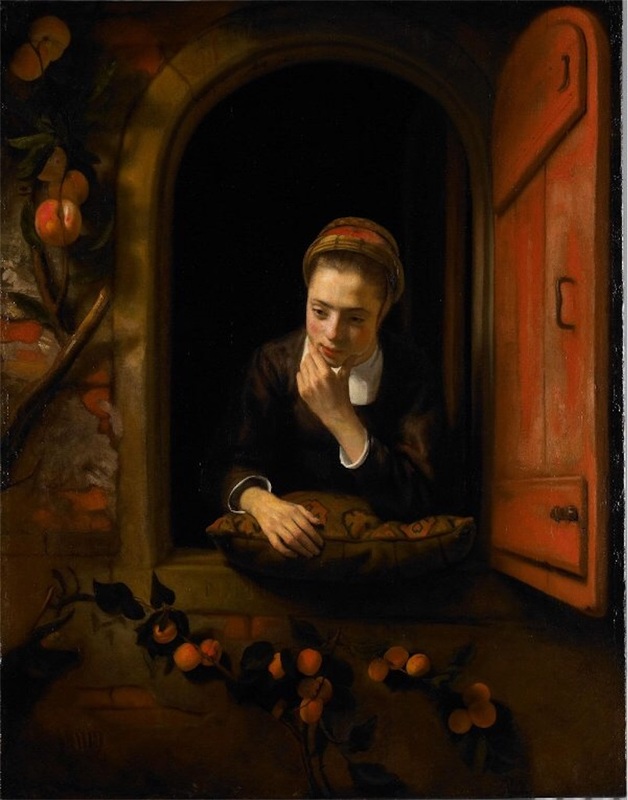 This exhibit brings together nine of the mere 35 existing works of Johannes Vermeer, often referred to as the "Master of Light", along with masterpieces from other Dutch painters at work in the Dutch Golden Age of the 17th century. 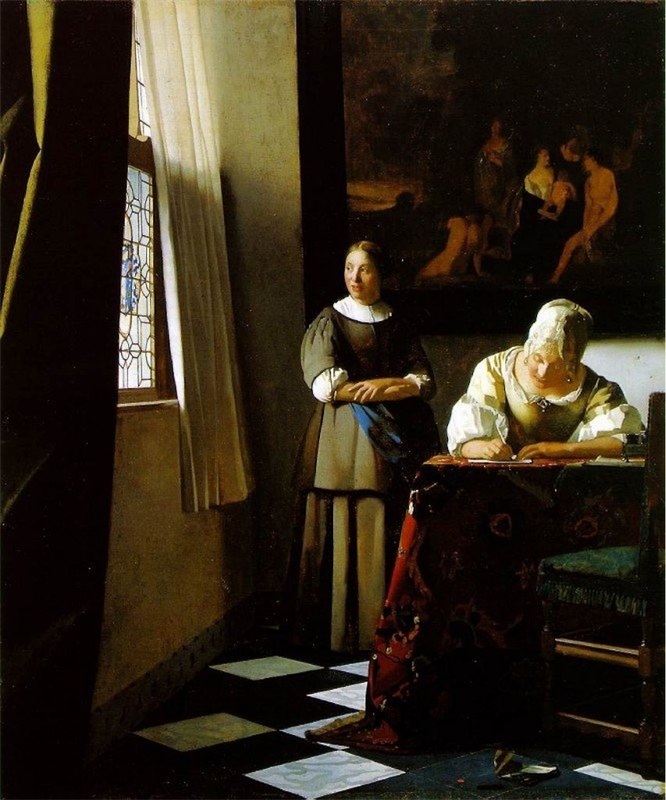 Although he is considered to be the "master of light", Vermeer expertly employs the "shadows" that exist with this light. He takes this collaboration of light and shadow to create tranquil spaces filled with mysterious sense of tension. I took advantage of this rare opportunity to take this in with my own eyes, and found myself completely absorbed in his world. Just like Caravaggio, he truly understood the mutual relationship between light and darkness, and deftly employed the two in his works. The light shining through the window illuminates the objects it hits, while those objects then cast shadows. 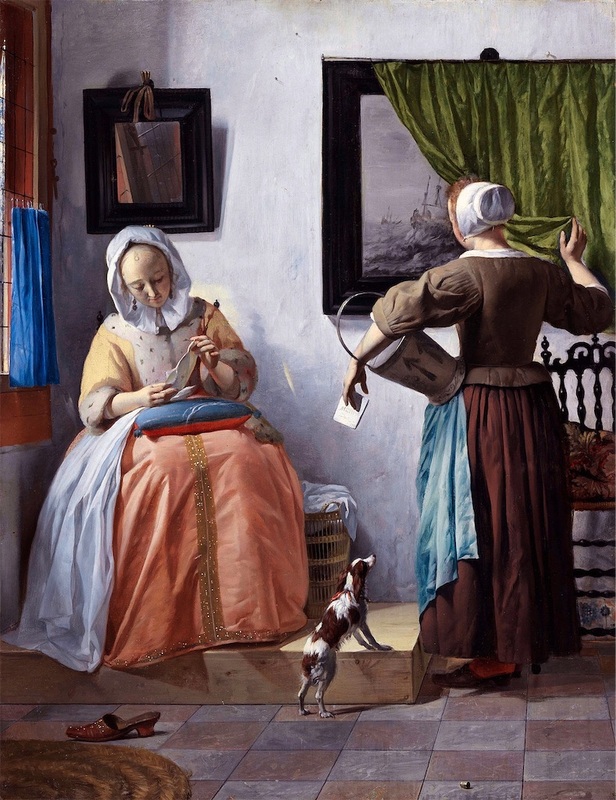 Vermeer's works show us that the "light" and "dark" are two sides of the same coin. He literally cuts deep moments of tranquility right of the ordinary, accentuating the contrast between "light" and "shadow" in a way that allows us to see the inherent poetry of it all. Reality is indeed reflected in pictures taken with a camera, but they lack that something we find in oil paintings. The paint adds an extra layer of texture and three-dimensionality, and the fact that we know it was created with a brush causes us to take note of the finer details. That is what makes art so wonderful. 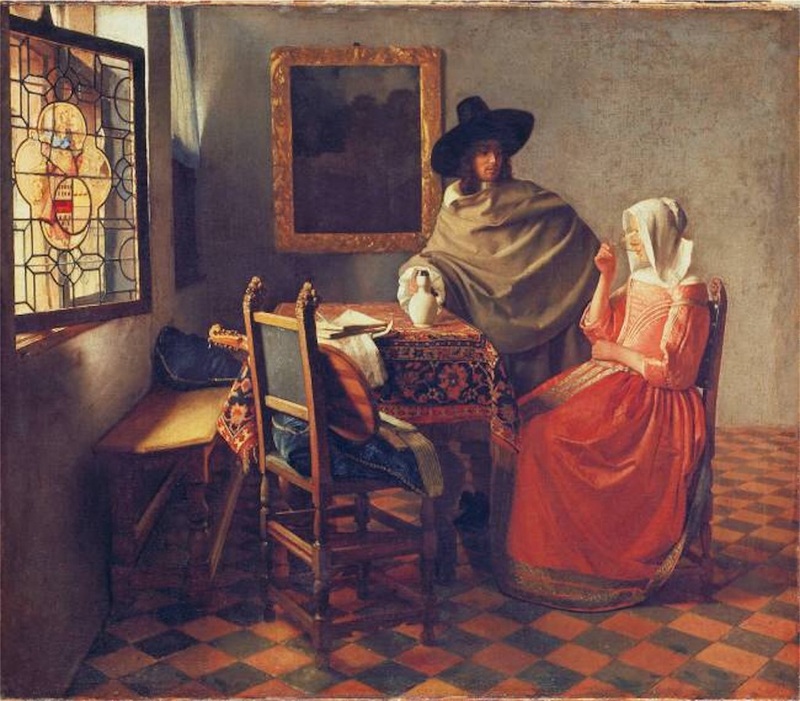 Japan was in the Edo Period when Vermeer was alive, and his native Holland was the only European power allowed to call on Japanese ports. 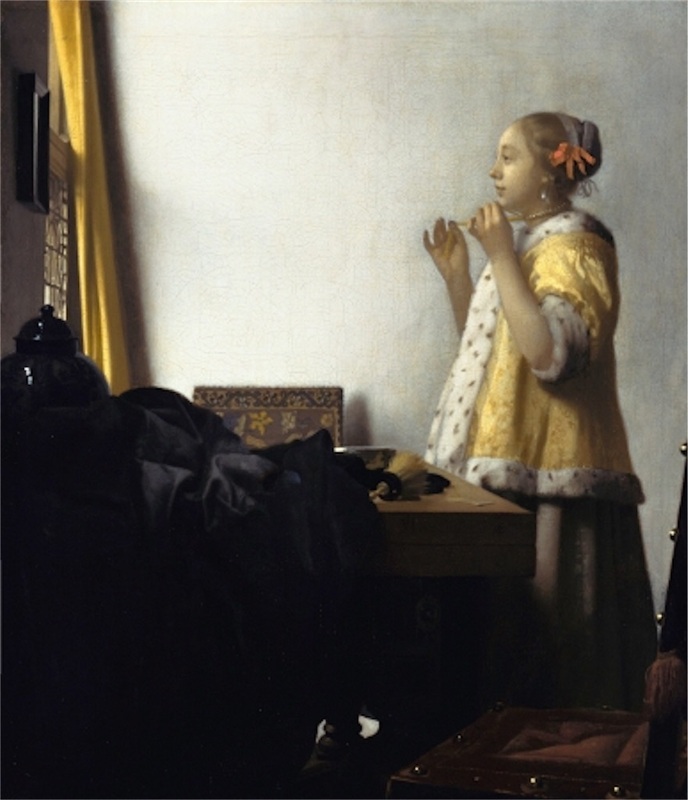 The thought of Vermeer coming to Japan during that era and painting the sights he saw fills me with excitement. Thorfinn's father is Thors, and he was once one of the four great generals of the Jomsviking army. He was known as the "Troll of Jom" for his ruthless cunning in battle. However, he grew weary of war and the utter futility of it all, and decided to flee to Iceland with his family, faking his own death. Laying roots in his new home, he lives in peace raising his family in a land without war, all the while searching for what it means to be a "true warrior." However, the bad karma from his life on the battlefield eventually rears its head, and once again he must head into the fray. Thorfinn is overwhelmed with excitement upon learning of the legendary exploits of his father, and there is a really impactful scene in which Thors finds him holding the weapons he used in the past. 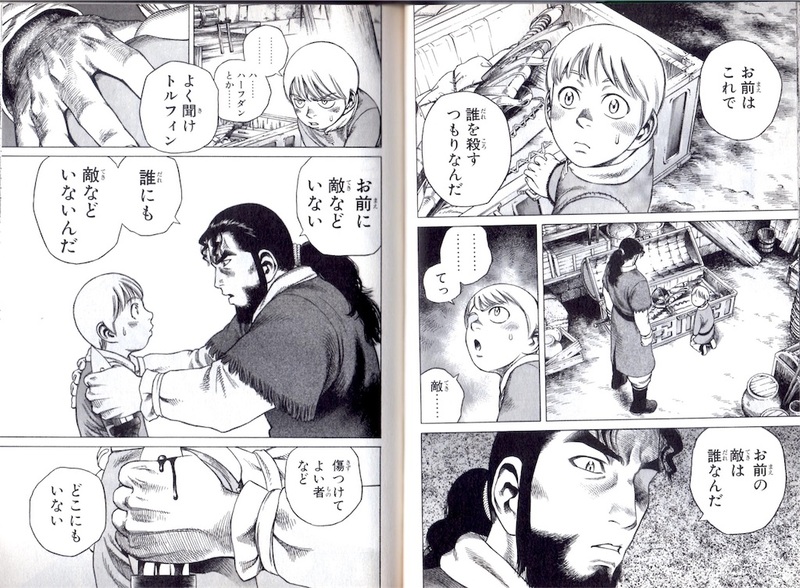 Speaking to his son, Thors attempts to convey the answer at which he arrived (English text below Japanese screenshots; manga screenshots read right to left). Thors: Tell me, who do you intend to kill with those? Thors: So who are your enemies? Thors: Listen Thorfinn... You have no enemies. That's true for all people. No one has any real enemies. There's nobody that deserves to be hurt... Not anywhere. Thors's fervent plea was essentially an oath to never to put anyone to his sword again, but it was too difficult for Thorfinn to understand. He was eager to see the "Troll of Jom" go berzerker on the battlefield, and this curiosity drives him to sneak on board his father's ship when it sets out for Europe the following day. However, they are ambushed in the Faroe Islands by a group of mercenaries hired to assassinate Thors. Thorfinn watches as his father is slain before his eyes in his duel with the Asherrad, the leader of the Viking mercenary troop. Thorfinn becomes consumed by a fiery vengeance and attaches himself to Asherrad's band, waiting for the day in which he can avenge his father's death. Asherrad is a truly fascinating character. He takes Thorfinn in and has him work alongside his men, despite knowing that the boy seeks to kill him and avenge his father's death. In a certain respect, we see Asherrad watching over Thorfinn as he grows up much like a father would. The reverse is true for Thorfinn, with Asherrad becoming that fatherly presence in his life... only to be killed right before his very own eyes again. 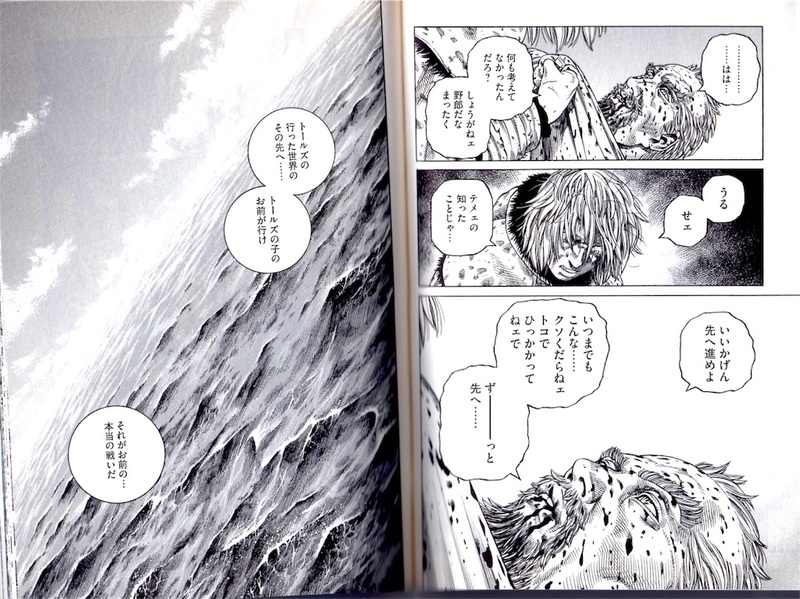 The scene depicting the final conversation between Thorfinn and a dying Asherrad is really touching. He attempts to convey the utter futility of a life of vengeance and ceaseless killing, much as Thors had done. Thorfinn: Don't you go dying on me! I won't allow it! Thorfinn: Get up! We have unfinished business to settle! You're mine to kill! Asherrad: (To himself) This is why you've always been a handful Thorfinn. Asherrad: (To Thorfinn) Tell me... What did you intend to do with your life after I'm gone? Asherrad: Haha, you've never thought about that. Goes to show with you. Asherrad: Go and become a true warrior... Son... of... Tors. 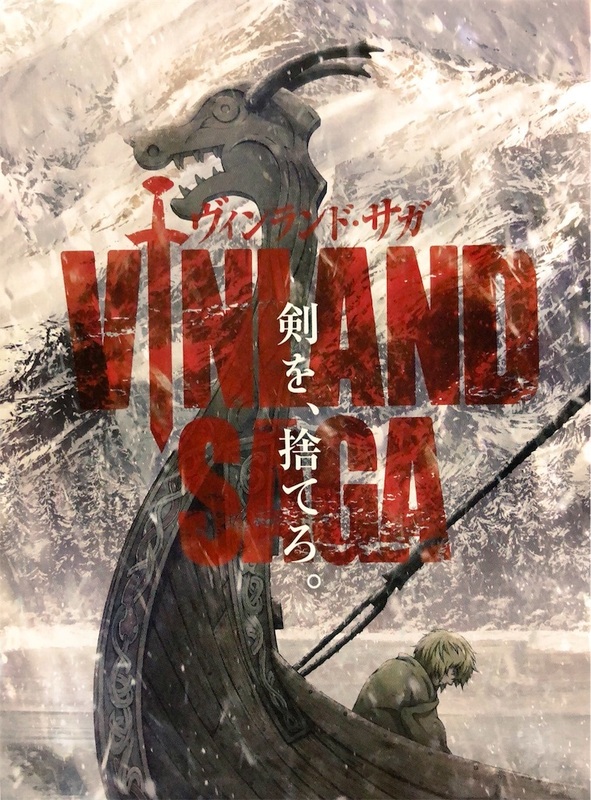 Thorfinn falls into slavery after Asherrad's death and is bought by the owner of a vast farm on the Jutland peninsula in Denmark, where he is charged with clearing the forest for new fields. The next few years of his life Thorfinn simply goes through the motions, having lost the object of revenge that he had made his sole purpose for living. Around the time he turns 20 he meets Einar, a young slave from a family of farmers, and their encounter marks a major turning point in Thorfinn's life. Einar makes an active effort to talk to Thorfinn as they go about their work on the farm, and these conversations help Thorfinn to open up. Until then, he had only known a blood-soaked existence of taking life, but his experience on the farm with Einar shows him the joy of cultivating life that in turn supports the lives of others. However, he still finds himself enveloped by the deep and dark swells of regret, and is assailed by nightmares each and every night. Wandering through this darkness, Thorfinn pledges to completely forsake violence and dedicate his life to helping the oppressed. He aims to take them to Vinland, the land far across the ocean that he heard of as a child, and create a place free of war and slavery. The scene in which he shares this newfound mission with Einar really speaks to the heart. 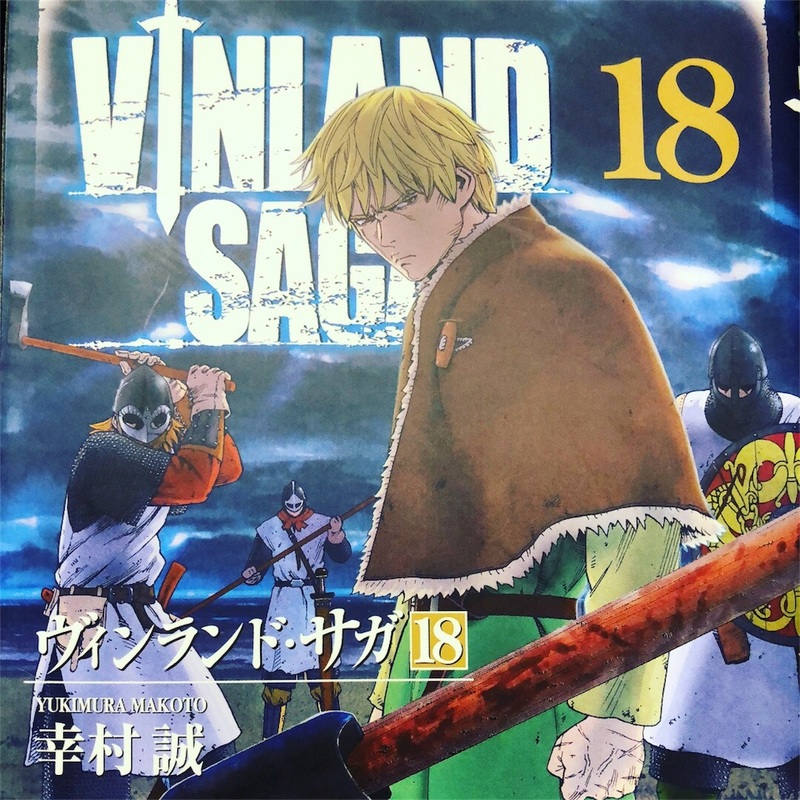 The author does a beautiful job portraying both the remorse Thorfinn feels for his past, and his determination to atone for his sins the best he can by fulfilling this mission. Einar: But there's people like you Thorfinn. You reject what many consider to be normal and right. Is it that strange to swear not to hurt others? Thorfinn: At least in Norse society... People label you a coward, and cowards get left out. Thorfinn: I've accepted it. There's no helping it. But it's probably best that way if I'm going to carry their burden. 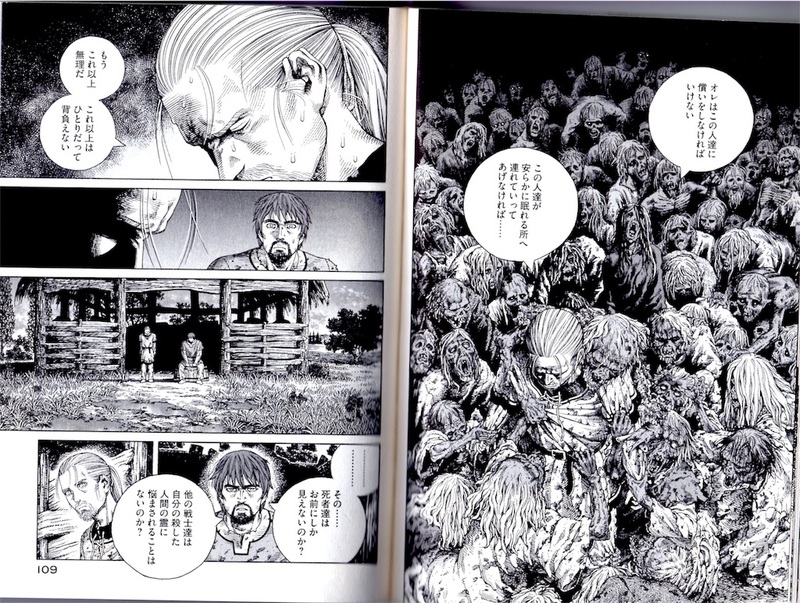 Thorfinn: That of the dead. Thorfinn: I'm visited every night by the souls of those I killed. They torment me. "Why did you kill me," they ask. "How could you kill all these people--fathers, brothers, and sons--knowing the anger and hate you felt when your own father was killed?" Thorfinn: But I can't take it any more. This burden is too much for me to bear alone. Einar: Do these dead souls only appear to you? Are other warriors tormented by the spirits of those they killed? 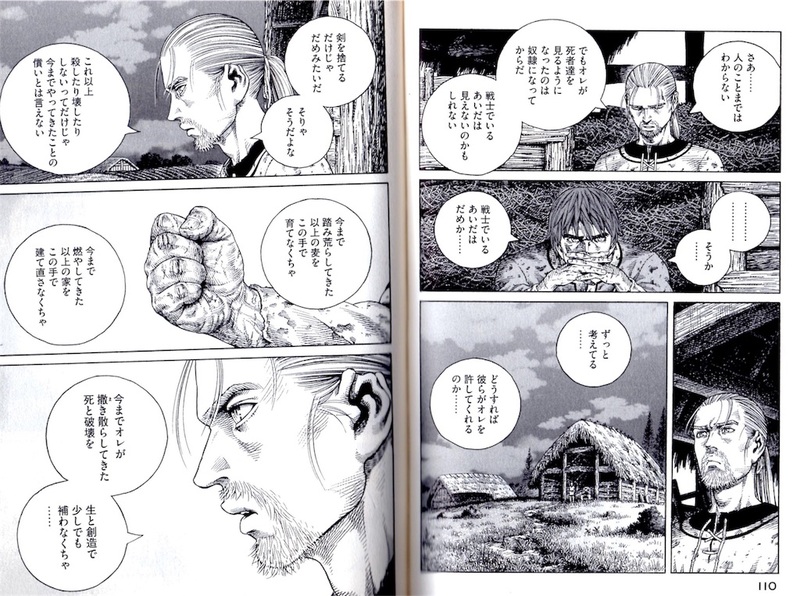 Thorfinn: I can't speak for others. In my case, I began to see them after I became a slave. Maybe we can't see them while we're still warriors. Einar: I see. I guess it's impossible to see them while people are still warriors. Thorfinn: It's always on my mind... finding a way to earn their forgiveness. Thorfinn: Laying down my sword doesn't seem to be enough... That's a given. Thorfinn: Simply promising to never kill or destroy anything does not suffice as atonement. Thorfinn: I need to grow more wheat than what I trampled under my feet. Thorfinn: I need to fix more houses than I burned to the ground. Thorfinn: I need to do what I can to weed out the death and destruction I sowed with the seeds of life and creation. While it's easy to destroy things, building them back up is much harder. 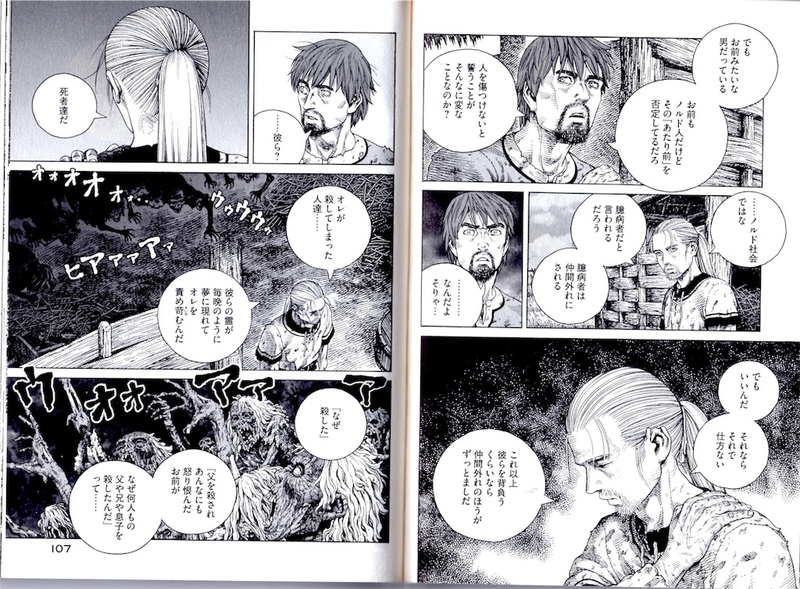 Just as I wrote above, Vinland Saga seriously examines the theme of atonement. The beauty of this manga, in my view, lies in its examination of this issue. "Is complete atonement truly possible?" I hope the answer to this compelling question slowly comes to light as Thorfinn's tale continues to unfold. The Japanese newspaper Mainichi Shinbun ran a special feature last year in December when The Last Jedi was released in which they asked people from different professions to talk about their own connection with the saga. 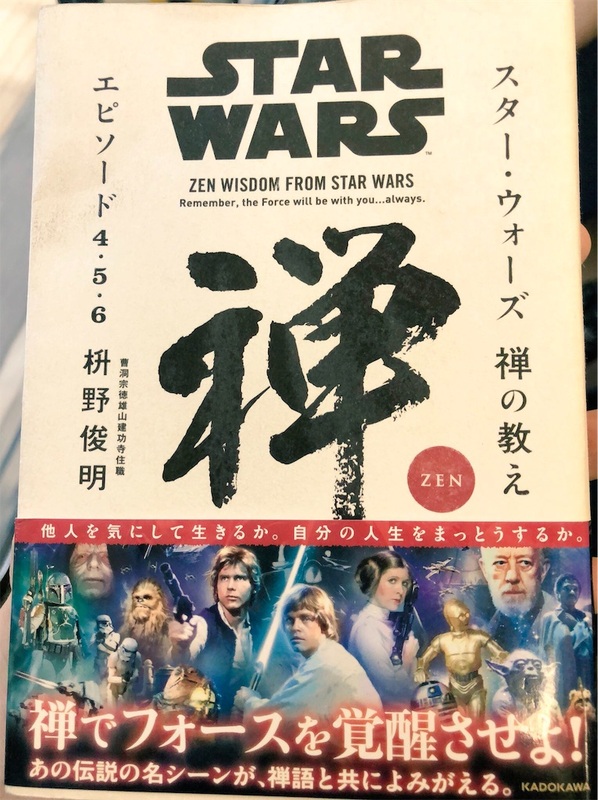 One of the people they interviewed for this article was the Zen priest Shunmei Masuno, and it was through this article that I discovered his book Zen Wisdom from Star Wars. I bought it at the end of the year and spent the next month reading a little of it every day on my train ride home. Just as the title implies, Masuno uses different Zen words to explain famous scenes from the original trilogy. It's a really fresh approach to Star Wars, and one that leads to many new discoveries. There were a number of words that really stuck with me, but the views Masuno conveys in the epilogue make this book one worth buying. This section conveys a great message that encapsulates the essence of the book, so I'd like to share this excerpt here for the reader's enjoyment. The words “May the Force be with you” form the beloved phrase that is uttered countless times throughout the saga by the Jedi and later on members of the Rebel Alliance. Using the Force, individuals can read the minds of others, influence their actions, parry the attacks of an oncoming foe, and move objects without physically touching them. Star Wars shows us that only individuals who have trained diligently are truly capable of wielding the Force. 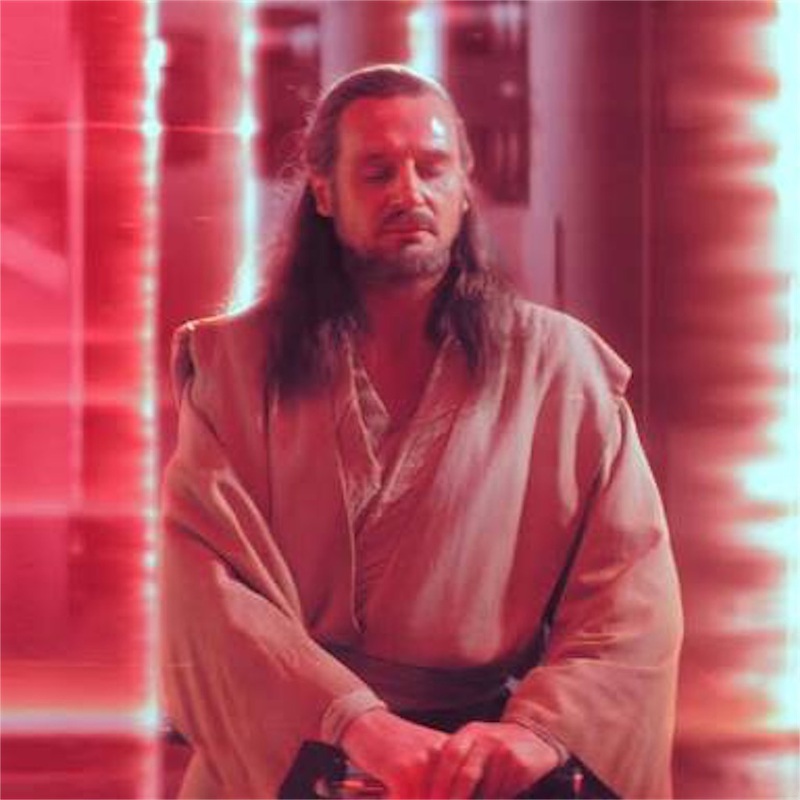 In watching the saga, I can’t help but think that the Force may be a representation of the power of Buddhism. The power I speak of is the “force” to do good deeds that is developed by putting Buddhist tenets into practice. There are famous legends of this power being used by Kuukai, the priest who brought esoteric Buddhism to Japan. Tales from regions all over the country speak of fresh springs and wells forming on the ground touched by Kuukai’s staff. 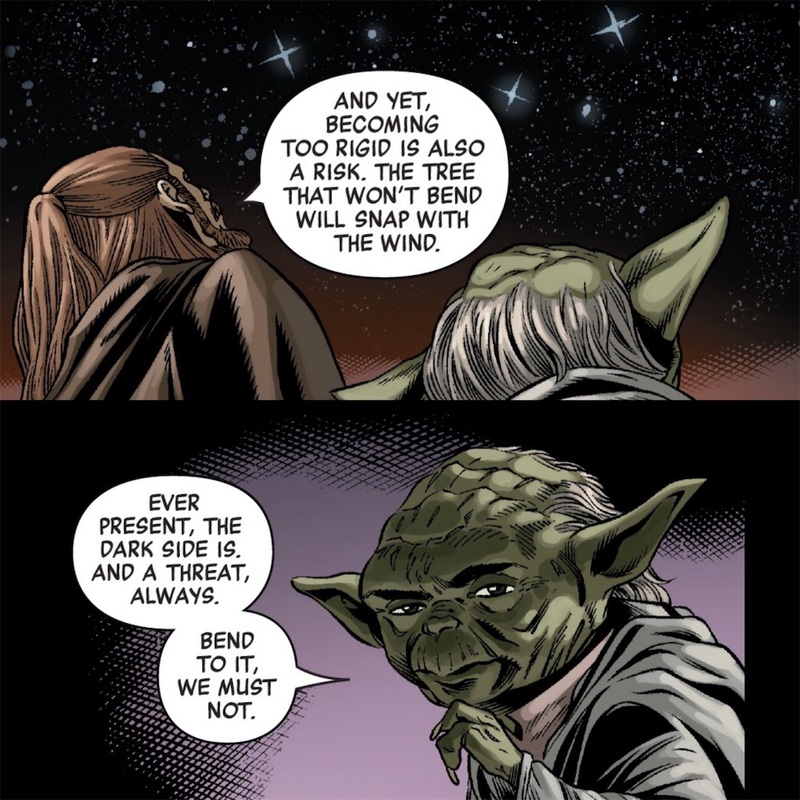 In Episode 5, we see Yoda teach Luke about the nature of the Force on a number of occasions. He tells Luke, “A Jedi’s strength flows through the Force. But beware of the Dark Side. Anger, fear, aggression; the dark side of the Force are they.” In Buddhism, these Dark Side elements are referred to as the “three kleshas that poison the soul”. They are “greed”, “anger”, and “ignorance.” I believe that Darth Vader can be taken as the personification of this triumvirate. In the original trilogy, Luke found himself faced with a decision: Does he kill his father, or does he give in to the Dark Side. He elected to do neither, refusing to embrace the call of the Dark Side or take the life of his father. He believed that a good heart still lay beneath the veneer of Darth Vader. Thus, he rejects the urges of greed that lead to the Dark Side and tosses aside his lightsaber. From a Zen Buddhist perspective, the act of throwing away his lightsaber can be expressed with the word 喜捨 (kisha, or literally “joyfully throw away/let go). 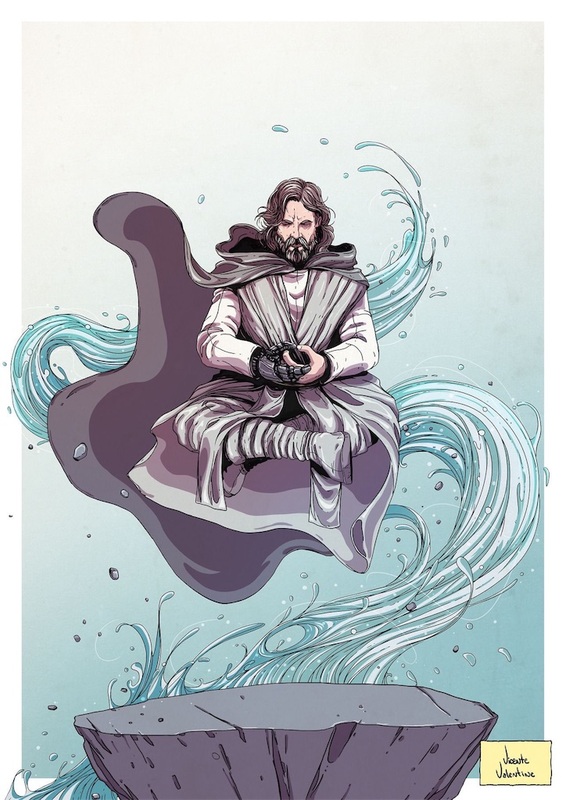 Luke believes in the compassion that dwells within his father, and this motivates him to let go of his attachments by discarding his Jedi weapon. When viewed in this light, the argument could be made that Luke used the Force to rid himself of the three kleshas (poisons) that threatened to taint his soul. The present is everything in Zen. There is no past or future. 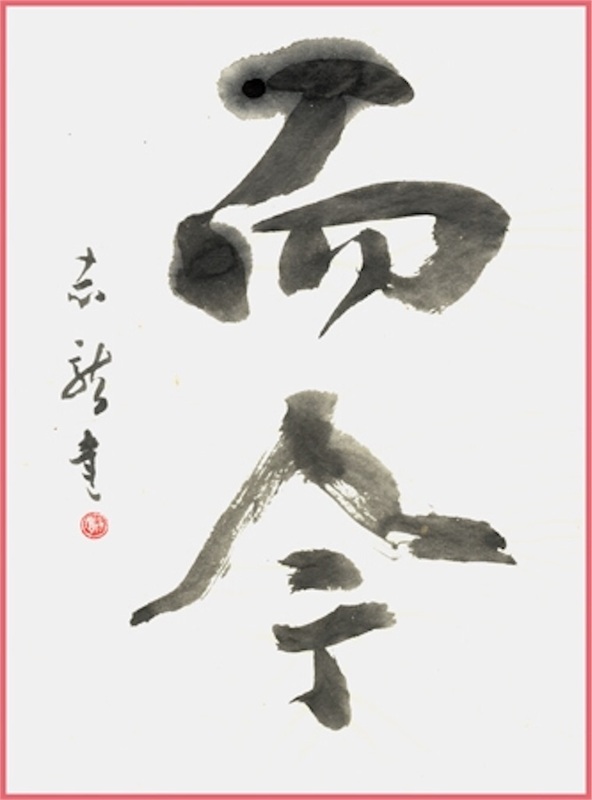 The Zen word “Nikon (而今)” introduced in this book is a straightforward expression of this concept, literally translating to “live in the moment”. That is what Zen is all about: focusing on what you need to do in this moment. 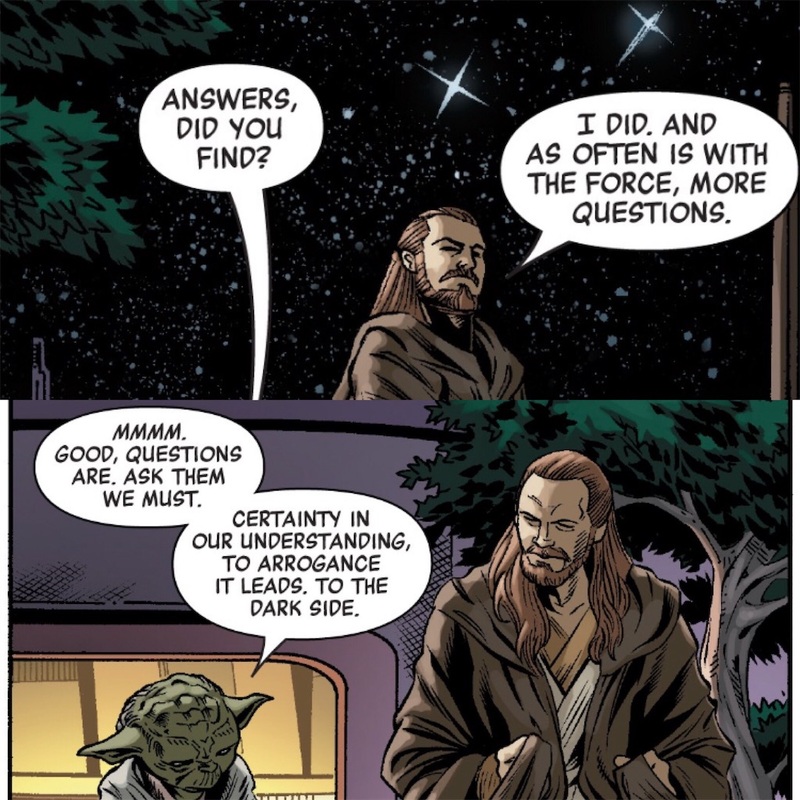 There are moments throughout the saga in which we see Yoda or Obi-Wan admonish Luke to concentrate on the ''now.'' I feel the first time Luke really became attuned to the meaning of “nikon” was during the Battle of Yavin. 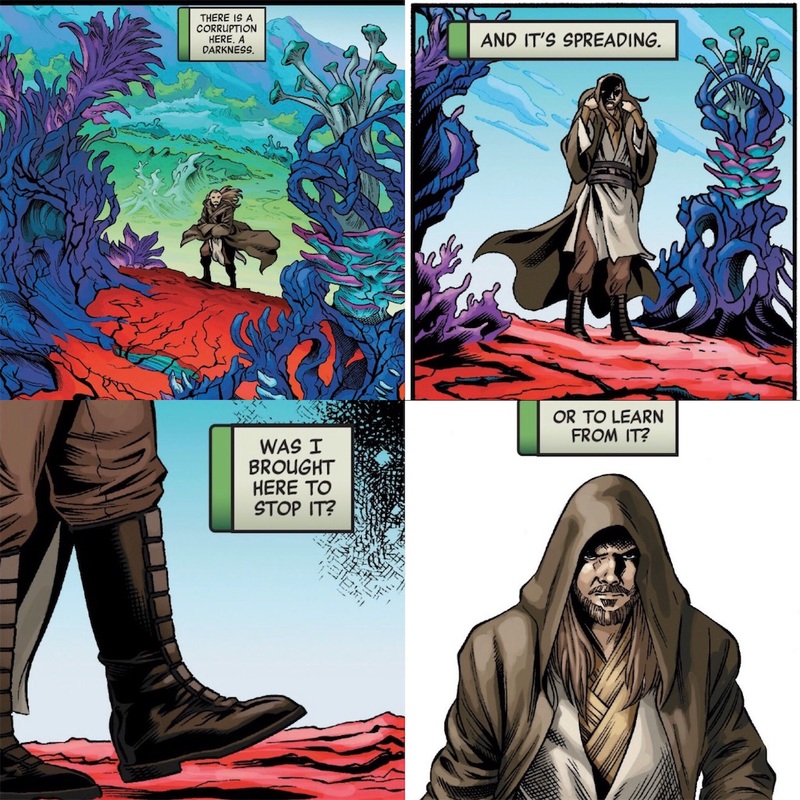 Luke hears the voice of Obi-Wan, who had become one with Force, and then turns off his targeting computer and chooses not to rely on his naked eyes, electing instead to focus on the moment. This moment of concentration enables him to blow the first Death Star to smithereens. The word “nikon" imparts an important lesson, teaching us that life is the steady accumulation of each passing moment. I feel in that moment in the Death Star trench was the first time that Luke truly understood how important the “now” is. From there he begins to long for peace in the future Republic and decides to take up the mantle of the Jedi. Such a grand vision seemed impossible to achieve when he sets out on his journey, but by drawing upon this “nikon” tenet and concentrating on the moment, light begins to shine on that end goal. Human beings fear losing that which we gain and hold onto. We also cast our thoughts to a future that has not yet come, and fret about things that have yet to come to pass. At the same time, all too often we reflect back on things in the past, tinged with regret over perhaps what we should have done. We must remind ourselves that neither the past nor future are part of the “here and now.” The underlying tenet of life is the “now.” That’s why we need to give our all in what we are doing in this instant. This continuous effort connects the figurative dots of each instance to form the line we know as life. Zen is all about refining our mind and heart. The Zen words conveyed in this book are an expression of the understanding and mind we gain through the application of these tenets. We live in a society seemingly controlled by stress, always hounded by the clock and struggling to find ample time and space to enjoy what we have. That is why it is so important to take a moment to still our mind and soul. Nothing would please me more than knowing this book helps to create those moments for you. This week I had some time off to take lifelong friends from back home visiting Japan to Showa Kinen Park to see a Japanese garden, something they were eager to check out. I had visited that park many times before, but I had never ventured to the back to see the Japanese garden there, so I was also really excited to see it. 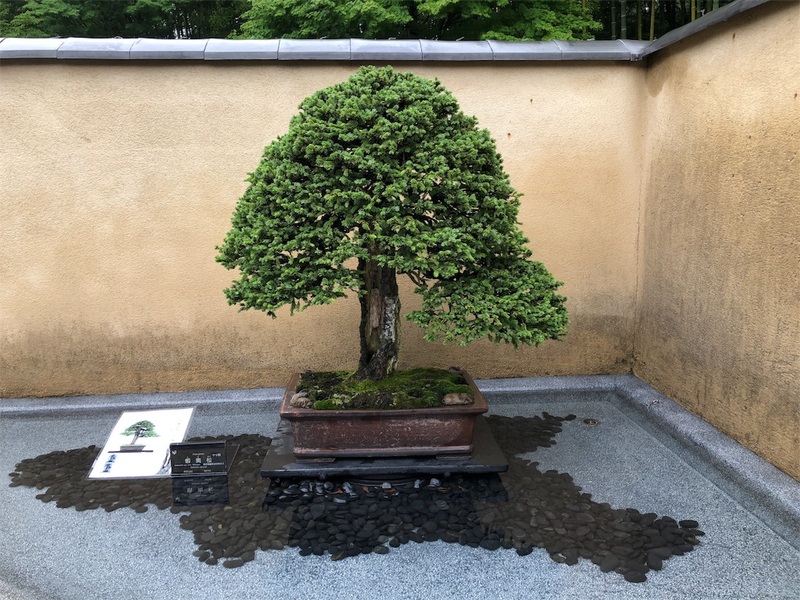 They had a bonsai garden, and with the weather typical fare for the rainy season there was no one else there to enjoy it. The soft mist falling had a rather soothing effect, creating an extremely relaxing atmosphere. The drops of rain resting on the leaves of the trees made the hues of green even more vivid, as if they were giving off a green light of their own. 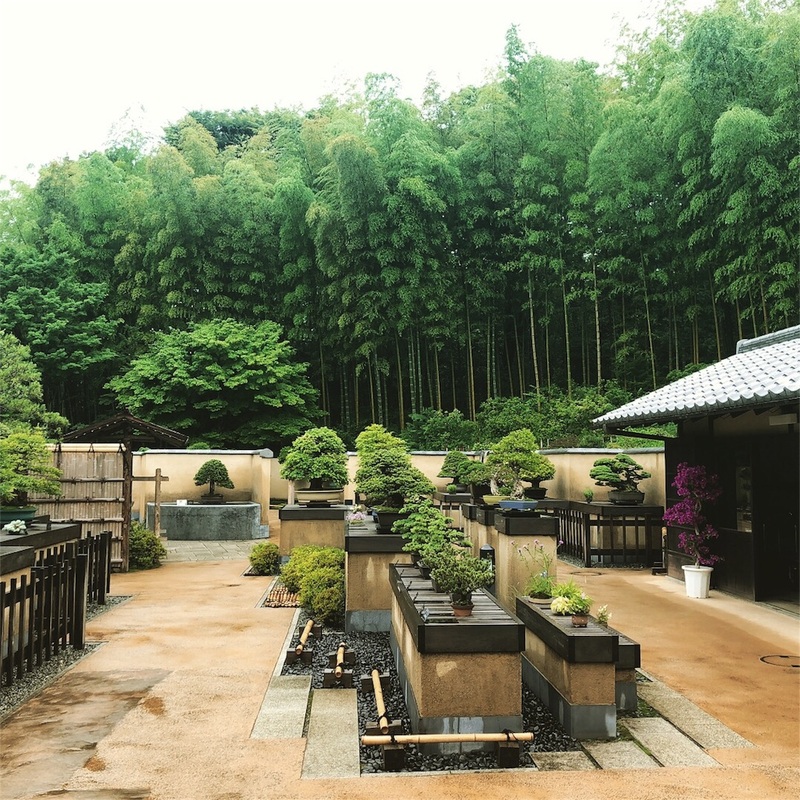 We were approached by (what appeared to be) the gardener that worked there, and he provided us with an detailed explanation about the fundamental elements of #bonsai, their essence, and things to keep in mind when viewing them. Thanks to this great lesson, I was able to enjoy the worldview of the tiny universe that unfurls within each bonsai creation, something I was never able to do before. A bonsai creation is comprised of primarily three elements. (1) #Nehari: This refers to the roots spreading out in all directions from the base, creating a sense of both stability and strength. (2) #Miki: This describes the stem rising up unfettered, naturally growing smaller and more concise as it stretches higher. (3) #EdaKubari: This refers to the branches extending out from the main stem, with the varying thickness and space between them achieving a fine balance. The ideal bonsai tree features a combination of these three elements. The way in which each tree is viewed varies by person. In the eyes of one person, a bonsai tree can resemble a waterfall, while to another it resembles a plume of smoke rising or a wave lapping up on the shore. 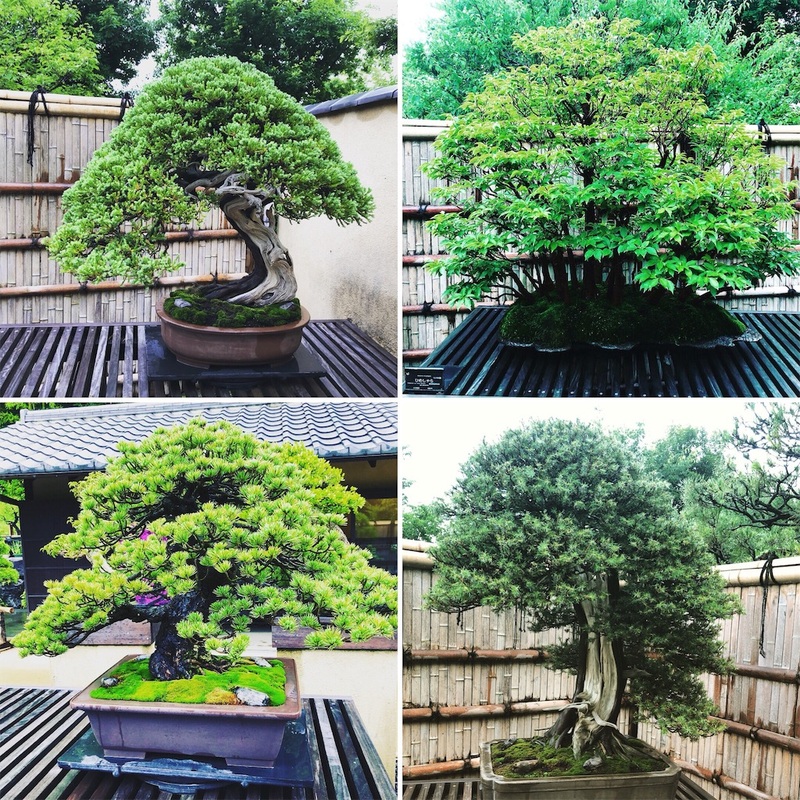 The most important thing is that each bonsai work delivers the essence of the art, which is simulating the grandeur of nature on a smaller scale. 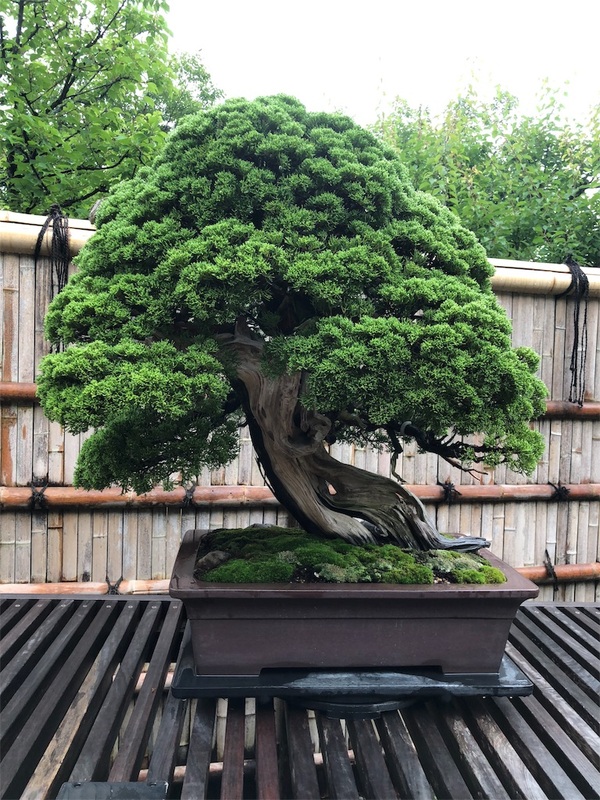 If I had to pick which type of bonsai I liked out of all the works on display, the pieces that really caught my eye were ones in which part of the stem was white. There was one piece of the "chokkan (straight stem)" variety that I liked a lot, and that tree was around 300 years old. At first I couldn't quite place why I liked that particular piece, but after listening to the gardener's explanation I was able to see the charm of this tree and form of expression imbued within it. According to the gardener, the white portion is actually the withered part of the trunk, and by leaving it within the piece the artist was able to convey the stark and severe face of nature. At the same time, the white portion of the trunk and the green of the fresh young leaves create a beautiful contrast, reminding us that "death" and "life" are inseparable. In short, this tree symbolizes the ebb and flow of life. That transience is the essence of the Japanese aesthetic. The end of May is upon us, and all around the hydrangeas are springing into bloom. This is a sign that the rainy season will soon be upon us. 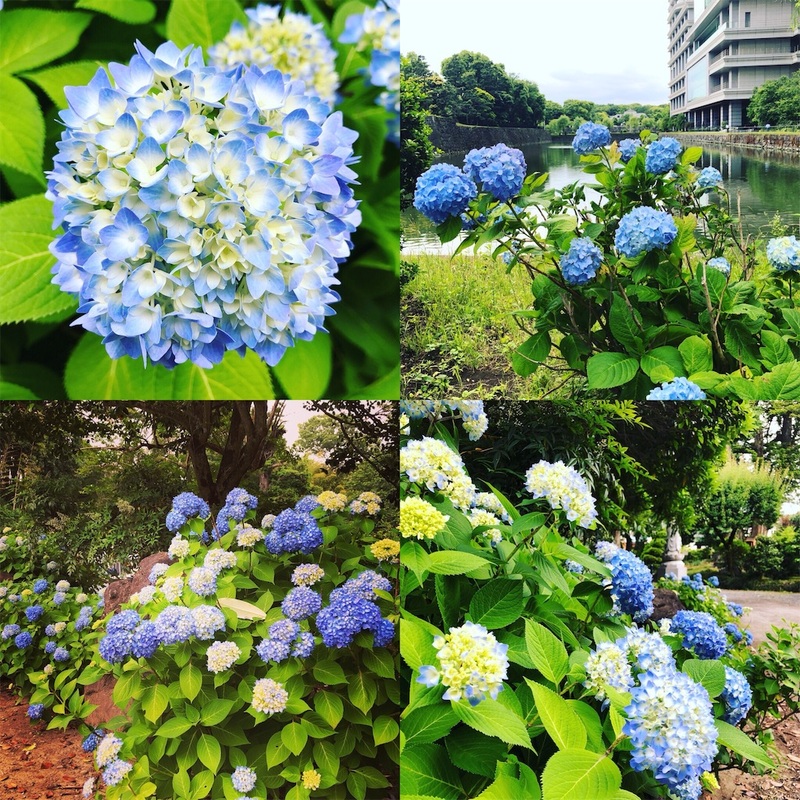 The cherry blossoms in full bloom are often considered to be a vista indicative of Japan, but personally I much prefer the hydrangeas that bloom in the run up to the rainy season. 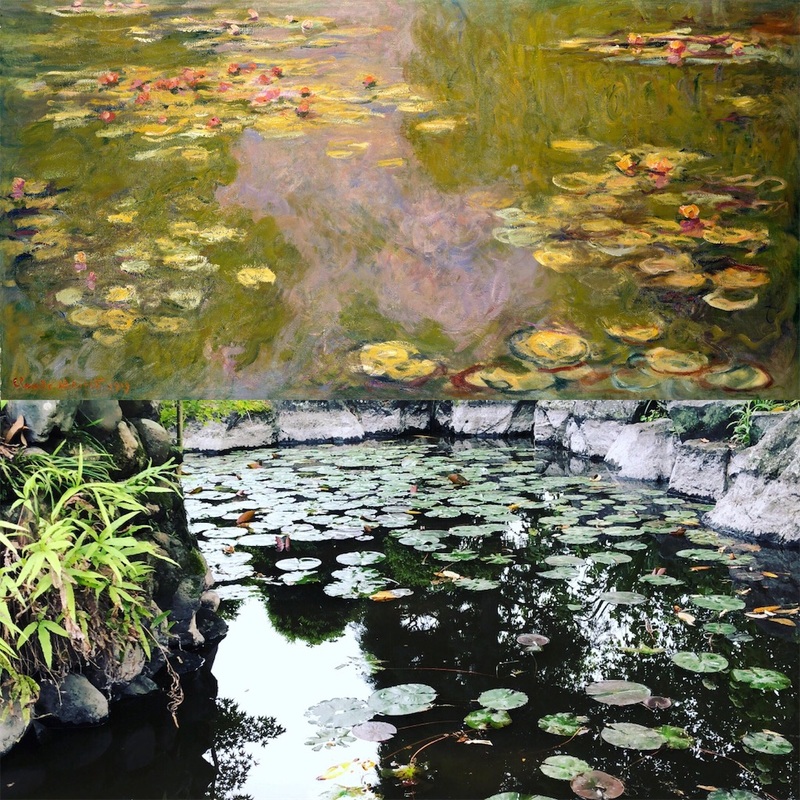 They remind me of splashes of paint that dripped off the brush of Monet or some other Impressionist painter, with the colors combining with the fresh green to create a delightful ensemble. Once again, they provide us with another sign of the passing of the seasons. I don't think Impressionists had Zen or Buddhism in mind, but their quest to capture their "impression" of a single instant coincides beautifully with the idea of Shiki Zoku Zekuu in the Heart Sutra. This four kanji construct conveys the idea of how the world is in perpetual motion, changing from instant to instant. The ability of the Impressionists to carve out those moments in their works could be taken as a representation of this concept. Therein is beauty because everything is in perpetual transition. Finding meaning in each single instant is the meaning of Shiki Zoku Zekuu, and that is what art is all about. On a side note, the characters that make up the Japanese word for hydrangeas (ajisai) literally translate to "purple sun flower". There are other varieties beside the purple one, so I think it's possible to make other combinations of characters. For the photos shown here, it might be best to write 白陽花 (white sun flower) or 青陽花 (blue sun flower).